On my mom’s recent visit to Maryland, she wanted Stacy and I to take her to a couple of our favorite cupcake places. One of those places was Kupcakes & Co., which we ranked number 1 in our Top 5 outside Baltimore City. While there, I tried their hummingbird cupcake for the first time. 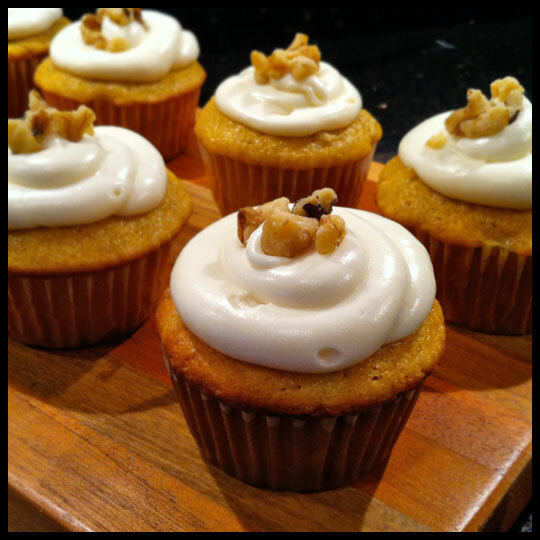 It was described as banana, pineapple, pecans, a little spice, and topped with cream cheese frosting, kind of like a spring-summer carrot cake. At the time, I thought this was a unique creation, but then I started seeing other places promoting their hummingbird cupcakes. I guess I’m still an amateur at this! Having loved Kupcakes & Co.’s hummingbird cupcake, I decided that for my spring-into-summer recipe I wanted this to be the cake. I also wanted to dabble with decorating cupcakes differently, to practice some techniques. 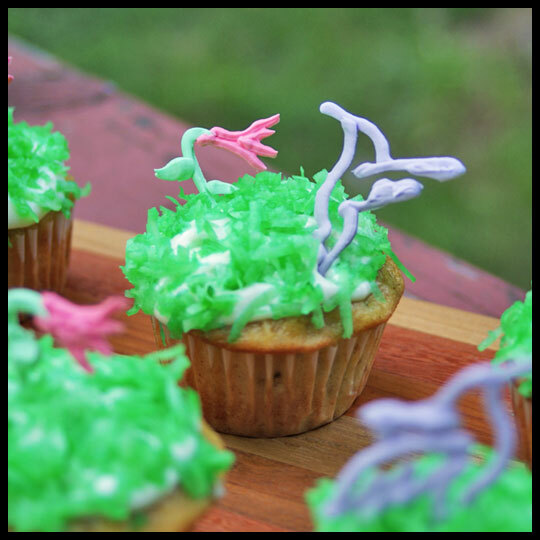 After researching the cake, I wasn’t sure if it would be sacrilegious to top a cupcake, based off a traditional southern recipe, with a springtime explosion. But these are my cupcakes after all! 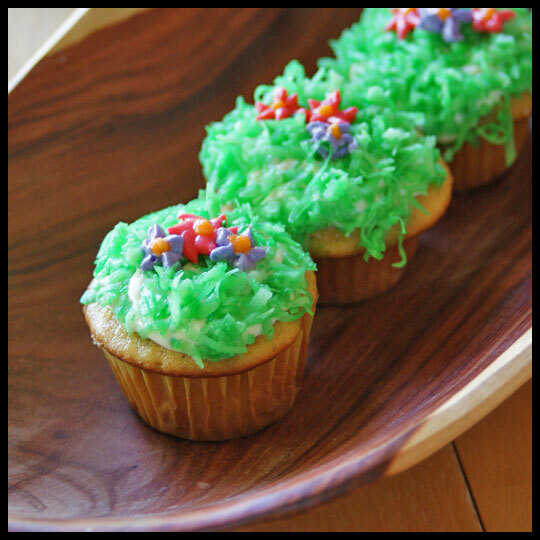 I found out that some recipes call for including coconut on top and thought this would be perfect for “grass.” I also wanted to practice piping flowers and hard royal icing decorations, so I did it all! Since I knew I’d be spending time on the decorations, I wanted the cake to be easy. I scoured the internet for a recipe that used a box mix to start, but had more trouble finding one than I anticipated. 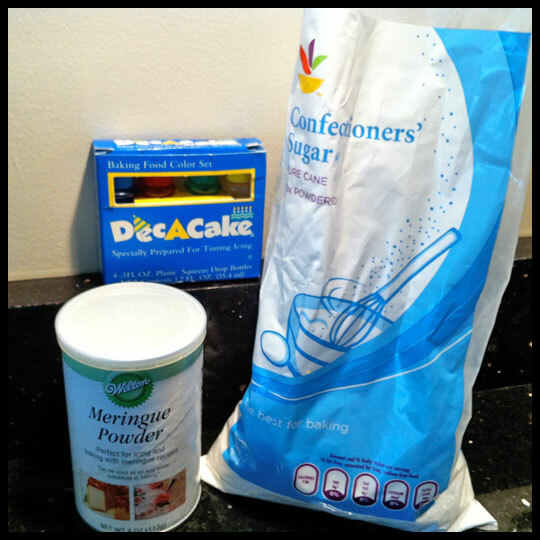 I discovered that the cake was a standard yellow cake, so just when I thought I would have to wing it, I finally found Duncan Hine’s recipe (now I know to just start at their website)! 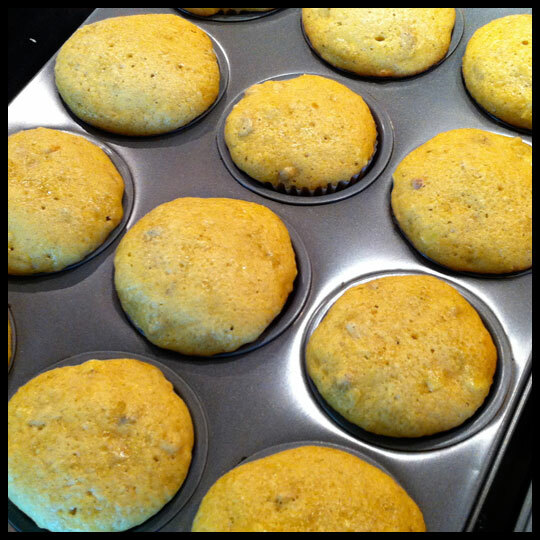 The recipe calls for the addition of Maraschino cherries, but since I hadn’t found that in other recipes, or in Kupcakes & Co.’s version, I decided to leave them out. 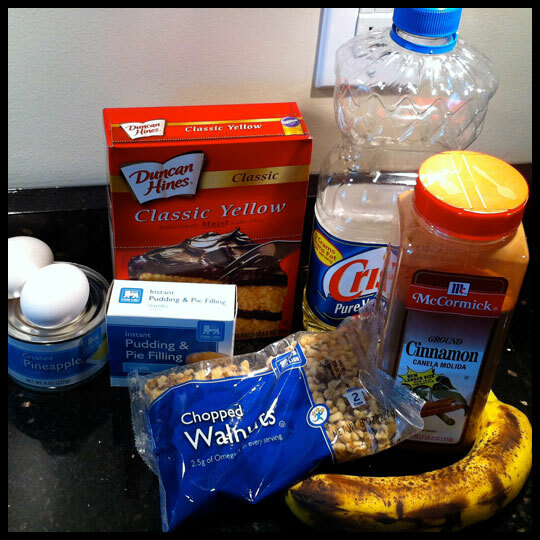 I also added a whole banana, instead of just half, and substituted walnuts for pecans. That was a last minute decision, after seeing how much more pecans cost versus walnuts. I had no idea! The cake part was really easy. I did make my own cream cheese frosting and after debating on which to go with, choose one from SlashFood. The reviews were good and it seemed similar to some of the other frostings I’ve made that start with a cream cheese base. I added extra confectioner’s sugar to get the consistency right, but I think that’s because I choose to do this on a warm day. 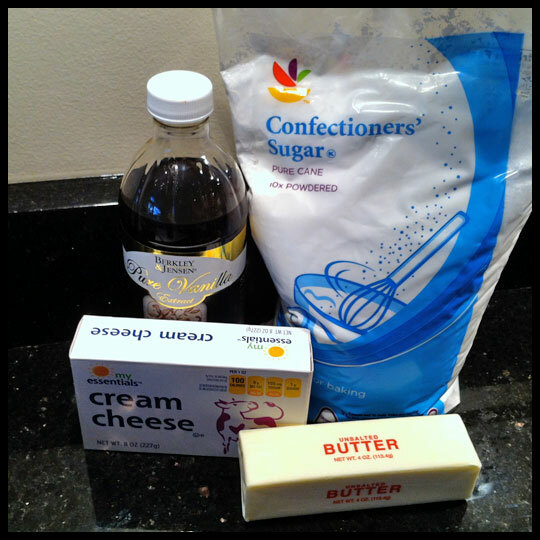 I used to think making frosting was complicated, but not anymore (or at least not the recipes I use)! 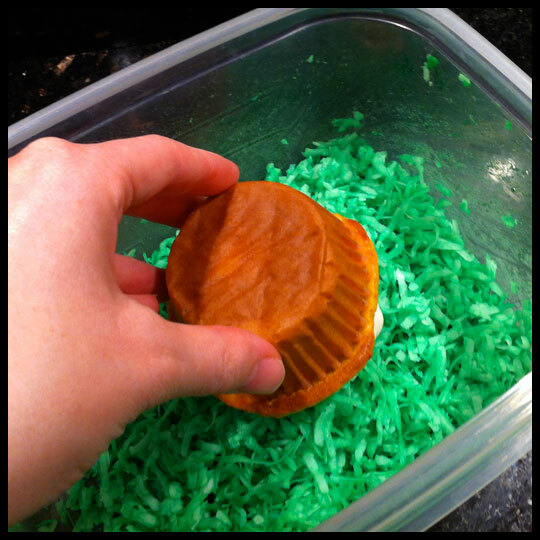 Starting the decorating process, I dyed shredded coconut using green food color. I had read about adding the dye to a little water first, but it just made the coconut almost too wet to work with. In the future, I will just put the dye right in, shake it up, and see what happens. 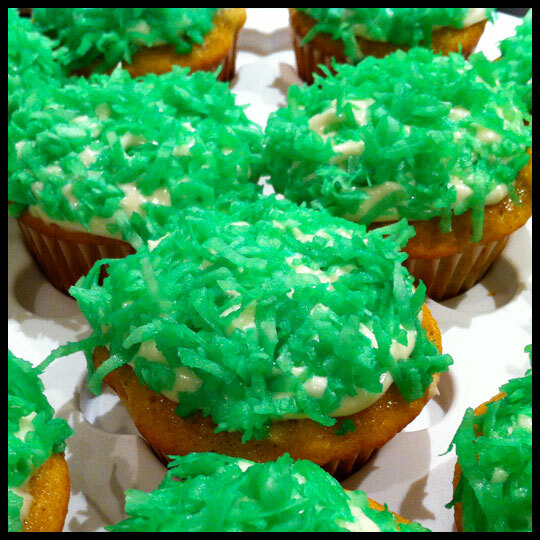 After the coconut was green, I took my frosted cupcakes and dipped them into the coconut to completely cover the tops. 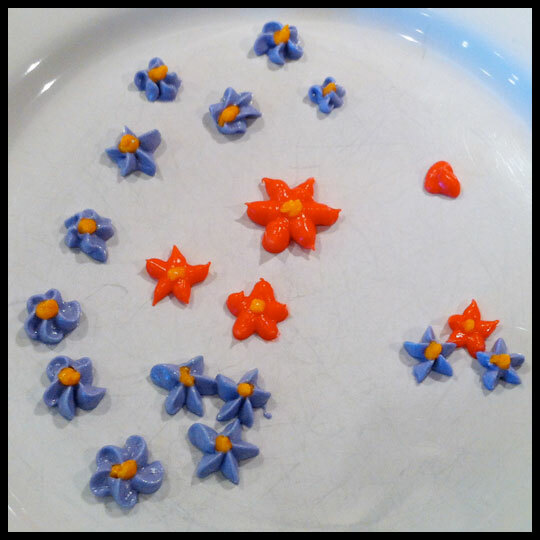 Since I wouldn’t be able to go out until the next day, I tried creating some piped flowers. After trial and error, I now realize that 1) it was just too warm in the house to get buttercream to cooperate and 2) I need more piping tips to choose from. After a trip out the next day, with my cupcakes only half decorated (and some with failed flower attempts), I was finally able to get the royal icing decorations done. The consistency still wasn’t where I wanted it, even after adding more water than called for (maybe this is why sifting first is so important? ), but I worked with it anyway and I’m pretty pleased with how they turned out! Flavor wise, the cake turned out great (but still not as good as Kupcakes & Co.)! I like the coconut on top because the cream cheese frosting turned out a little sweeter than I prefer, so the coconut toned it down. Aside from having some great tasting cupcakes, I learned some new things. My favorite technique is the royal icing decorations. I feel like the possibilities for custom cupcake toppers are now endless! What are some favorite things you’ve learned by challenging yourself in the kitchen? This entry was posted in Baking, Cupcakes and tagged Baking, banana, Box Mix, coconut, Cream cheese, Cupcake, cupcake toppers, decoration, decorations, duncan hines, Hummingbird, pineapple, toppers, walnuts, yellow cake by Crusader Jenn. Bookmark the permalink. I love hummingbird cupcakes. These are the most creative decorations I’ve seen for them – well done!! I’m not sure I’d be able to pull it off! I was also impressed at what Jenn did with these cupcakes too! It’s amazing what a little practice and patience can achieve! 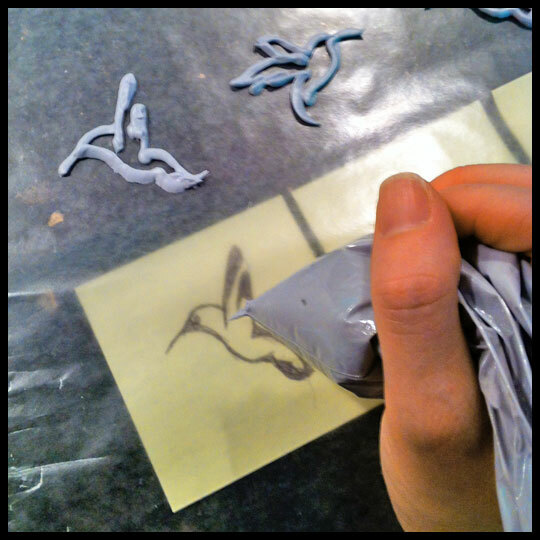 Your humming birds look great!